The mental foramen (MF) is a very important anatomic structure for local anesthetic, implant placement, periapical and orthognathic surgery. Its variations have to be recognized in order to prevent further complications. We are reporting two very rare cases of patients with unilateral absence of MF. The patients were examined with CBCT and one of them had sensory disturbances appeared immediately after implant installation in the region the missing right MF. In cases when the mandibular canal and mental foramen are not clearly visible on plain X-rays in order to see them and to avoid injury of the neurovascular bundle CBCT is a method of choice. Cone beam computed tomography, Mandible, Mandibular canal, Mental foramen, Implants, Paresthesia. Тhe mental foramen (MF) is an opening on the outer surface on the anterolateral part of the body of the mandible. It transmits the mental nerve branches and blood vessels ensuring innervation and vascularization of the skin of the chin, mucosa of the lower lip and gingiva. The MF is an important structure for local anesthesia, implant placement, periapical and orthognathic surgery and have to be recognized in order to prevent further complications. The variations of its shape, size and location are largely influenced by individual, gender, age, race, accessing technique used and degree of edentulous alveolar bone atrophy . The typical location of MF is in the region of the mandibular premolars (closer to the second premolar) and usually both foramina are located at the same level [2-4]. MF can be seen during surgical exploration or with imaging methods such as CBCT, CT, MRI and with some limitations on panoramic tomography and intraoral plain X rays. Due to superimposition of anatomic landmarks, peculiarities of the trabecular bone structure, thinning of the mandible and images distortions the MF may not be always seen on the radiographs [2,5-7]. According to Ngeow et al. and Muinelo-Lorenzo et al. on panoramic tomography MF could not be identified (or it is absent) in 22.2 % and respectively in 16.13 % of cases [8,9]. The number of mental foramina can vary from absence up to four foramina on one side [10,11]. The presence of accessory foramina is much more common than the absence of MF [5,10]. There are a few case reports about absent MF [3,12-16]. We report two cases of unilateral absence of MF. One of them is a patient with sensory disturbance in the region of the missing MF after implant installation. At best our knowledge this is the first reported case of absent MF combined with sensory disturbance after an implant installation. The patients had given informed consent for this examinations and the case description was carried out in accordance with the principles described in the Declaration of Helsinki and amendments and revisions. Only the investigators had access to the patient data. A 40 y old Bulgarian Caucasian patient (female) was examined with CBCT to evaluate his mandible before dental implant treatment. The patient had not a trauma, previous surgery (except tooth extraction of 36 and 47) or any complaints. Cross sections of the mandible, axial and coronal slices and VR images also were carefully assessed from a certified radiologist with 10 years’ experience in CBCT examinations in maxillofacial region. The left MF was detected on the expected location-on the buccal surface in the region of both premolars. MF was not found at the opposite site (Figure 1).Right mandibular canal medially continue as mandibular incisive canal which branches on subtle (<1 mm) canals. Small incisive canals branches (noticeable on Figure 1) with vertical course were seen buccally in the regions of 43-44, 31-32, 33-34 teeth. Figure 1: A well-defined left mental foramen is seen on cross-sections (solid arrows) and VR panoramic reconstruction. No presence of MF at right side. Subtle vertical canals (empty arrows), branches of mandibular incisive canals are visible in the regions of teeth 31- 32, 33-34 and 43-44 buccally. The patient is a 71 y old (male) with paresthesia in the right mental nerve region which appeared immediately after implant insertion. The procedure was done before 12 months in other dental practice. On the CBCT exam partially edentulous lower jaw with four implants and severe periodontitis involving the canines and lateral right incisor were seen. Intraosseous implant in the region of missing tooth 45 in contact with the medial end of the right mandibular canal was also detected (Figure 2). Figure 2: Well shaped left MF (solid arrow) and uninterrupted buccal cortex of the right mandible without MF (empty arrow) are seen on crosssections. The dental implant in the region of missing tooth 45 is in contact with the medial end of the right mandibular canal. The buccal compact layer in the right mandible is without interruptions and without MF. The opposite MF is well defined and clearly visible (Figure 2). The absence of MF is a very rare anatomical variant. In dry human mandibles (n=1435) de Freitas reported absence of MF on the right mandible in 0.06% and in 0.03% on the left . Silva et al. reported an interesting case of unilateral MF absence in female and unilateral hypoplasia of the mental foramen in the mandible of her mother. The authors consider that variations of the MF may partly arise through genetic factors . Ulu et al. reported an absence of left MF and found a protuberance on the surface at the same area . In our cases we noticed subtle bilateral protuberances in the areas of the mental foramina. In cases when the MF is not presented the mental nerve and blood vessels are thin and probably run with an alternative course, which could not be visualized [14,15]. The presented second case illustrates a unilateral absence of MF and necessity of clear mapping of the course of the mandibular canal in order to avoid an injury of the neurovascular bundle in it. Limitation of this case is the impossibility for surgical exploration of the region because of the advanced osteointegration of the implant and the patient’s decision not to remove it. Another limitation is the absence of CBCT or MRI exams prior the implantation to show clearly the canal/ neurovascular bundle in order to exclude underlying pathology e.g. schwannoma, neuroma etc. In some patients the absence of mandibular canal corticalization can limitate CBCT and in such cases MRI or CT/MRI fusion can be used [17,18]. In most of the cases when the mandibular canal and mental foramen are not clearly visible on plain X-rays in order to see them and to avoid injury of the neurovascular bundle CBCT is a method of choice. Juodzbalys G, Wang HL, Sabalys G. Anatomy of mandibular vital structures. part ii: mandibular incisive canal, mental foramen and associated neurovascular bundles in relation with dental implantology. J Oral Maxillofac Res 2010; 1: 3. Haghanifar S, Rokouei M. Radiographic evaluation of the mental foramen in a selected Iranian population. Indian J Dent Res 2009; 20: 150-152. Lauhr G, Coutant JC, Normand E, Laurenjoye M, Ella B. Bilateral absence of mental foramen in a living human subject. Surg Radiol Anatomy 2015; 37: 403-405. Pokhrel R, Bhatnagar R. Position and number of mental foramen in dry human mandibles: comparison with respect to sides and sexes. OA Anatomy 2013; 1: 31. Greenstein G, Tarnow D. The mental foramen and nerve: clinical and anatomical factors related to dental implant placement: a literature review. J Periodontol 2006; 77: 1933-1943. Jacobs RN, Mraiwa D, Van Steenberghe G, Sanderink MQ. Appearance of the mandibular incisive canal on panoramic radiograph. Surg Radiol Anatomy 2004; 26: 329-333. Scarfe WC, Chr A. Maxillofacial cone beam computed tomography: principles, techniques and clinical applications. Springer 2018; 292. Muinelo-Lorenzo J, Suarez-Quintanilla JA, Fernandez-Alonso A, Varela-Mallou J, Suarez-Cunqueiro MM. Anatomical characteristics and visibility of mental foramen and accessory mental foramen: panoramic radiography vs. cone beam CT. Med Oral Pathol Oral Cir Bucal 2015; 20: 707-714. Ngeow WC, Dionysius DD, Ishak H, Nambiar P. Effect of ageing towards location and visibility of mental foramen on panoramic radiographs. Singapore Dent J 2010; 31: 15-19. Hasan T. Mental foramen morphology: a must know in clinical dentistry. J Pak Dent Assoc2012; 21: 168-173. Yovchev D. Quadruple mental foramina detected by CBCT: a case report. Eur Rad 2014.
de Freitas V, Madeira MC, Toledo Filho JL, Chagas CF. Absence of the mental foramen in dry human mandibles. Acta Anat (Basel) 1979; 104: 353-355. Hasan T, Fauzi M, Hasan D. Bilateral absence of mental foramen-a rare variation. Int JAnatom Variat 2010: 3: 167-169. Matsumoto KM, Araki KH. Bilateral absence of the mental foramen detected by cone-beam computed tomography. Oral Radiol 2013; 29: 198-201. Silva Ramos Fernandes LMP, Capelozza ALA, Rubira-Bullen IRF. Absence and hypoplasia of the mental foramen detected in CBCT images: a case report. Surg Radiol Anatomy 2011; 33: 731-734. Ulu M, Ertas ET, Gunhan F, Atici MY, Akcay H. Unilateral absence of mental foramen with surgical exploration in a living human subject. Case Rep Dentistry 2016. 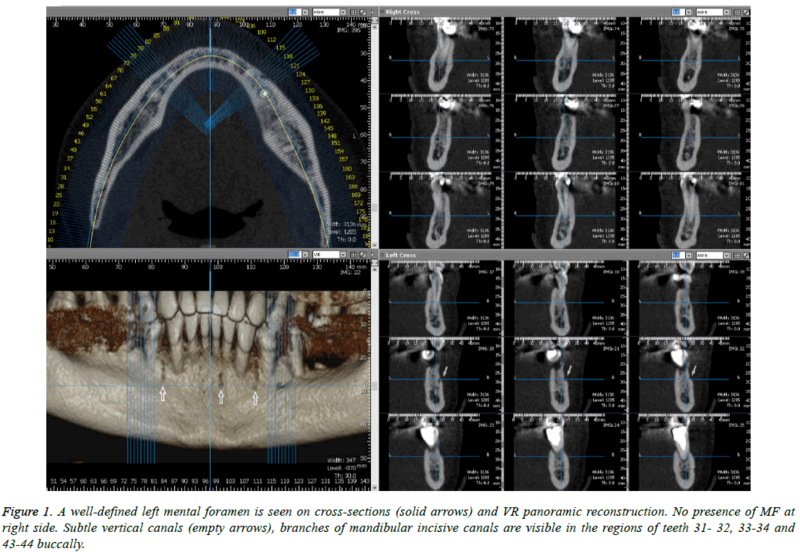 Deepho C, Watanabe H, Kotaki S, Sakamoto J, Sumi Y, Kurabayashi T. Utility of fusion volumetric images from computed tomography and magnetic resonance imaging for localizing the mandibular canal. Dentomaxillofac Radiol 2017; 46: 20160383. Imamura H. A comparative study of computed tomography and magnetic resonance imaging for the detection of mandibular canals and cross-sectional areas in diagnosis prior to dental implant treatment. Clin Implant Dent Relat Res 2004; 6: 75-81.